A third-party evaluation was conducted from April to October 2017 to assess the results of the Nuclear Security Project at the Ulba Metallurgical Plant (UMP) of the Republic of Kazakhstan (*completed in February 2015 with 337 million JPY disbursed). 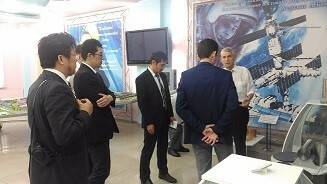 In June, two experts from the Center of the Promotion of Disarmament and Non-Proliferation (Tokyo), which is entrusted with the task of evaluation, visited the UMP in Ust-Kamenogorsk for inspection of the facility, as well as discussed the performance of the project with the Committee on Atomic and Energy Supervision and Control of the Ministry of Energy and National Atomic Company “Kazatomprom” in Astana. The evaluator made a comprehensive analysis of the project, including operational conditions of the physical protection system, improvement of the staff’s competence through training courses, impact and synergy of the project, and sustainable efforts being made by the facility for strengthening nuclear security. The findings of the evaluator were compiled into a report and presented to the Japan-Kazakhstan Committee with recommendations and lessons learnt for the future activities.